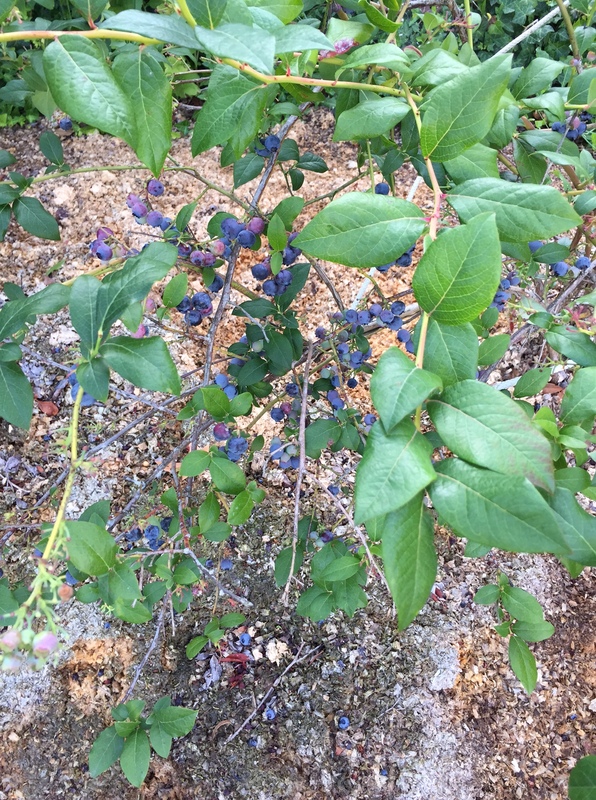 I got 3 cups of blueberries off the 2 bushes at my new house. They are nearing the end of their crop, but I loved getting what I did. We did 2 days of work on the new house, in preparation for refinishing the hardwood floors. By the front door, there were 2 layers. Layer #1 came up easily. Layer #2—Yikes! 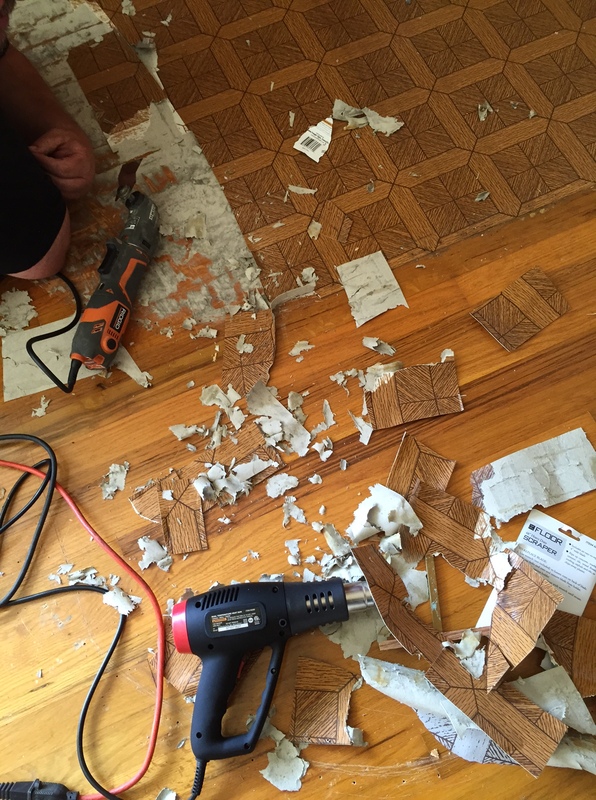 They had glued linoleum to the hardwood, probably in the 60’s (?) The heat gun was useless. The tool (above) that we borrowed worked the best. We had to use several blades. That white glue is very hard to remove without gouging the actual floor. We are still not quite finished, but will finish that soon. The work we did ourselves saved us a bundle. 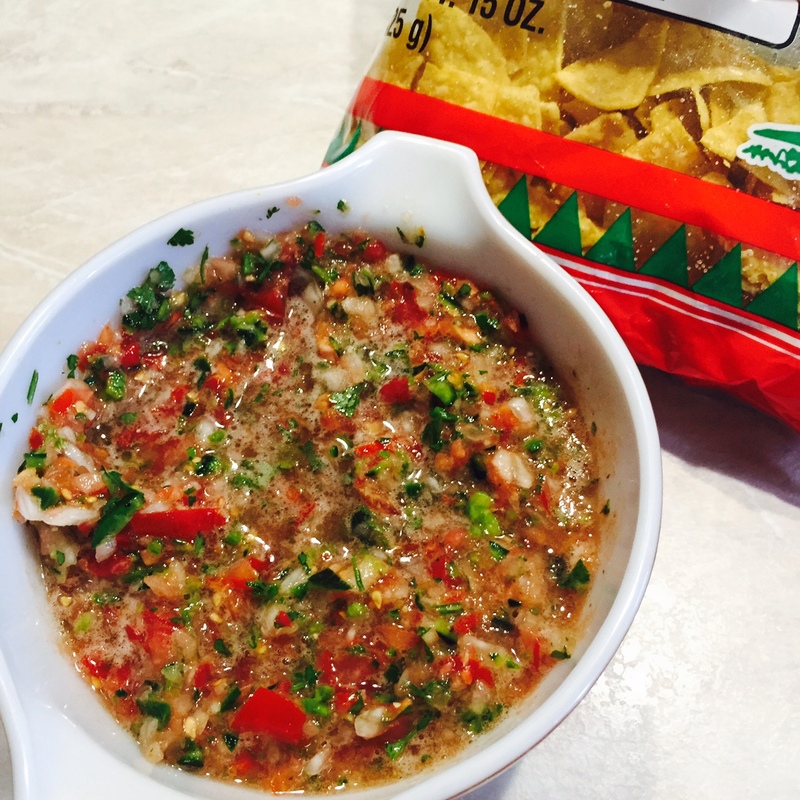 I made pico de gallo from peppers, cilantro, onion and tomatoes from the garden. I was also able to make a lot of meals at home this week, and was able to take food down to Salem when we were working on the new house. I was able to weed a bit, and harvest a lot from the garden. I was also able to help out with my sister’s u-pick peach business a couple of days. It’s fun and I enjoy doing it and it helps them out during their busy time. When they are really busy, sometimes I get to cook for everyone–super fun! I love cooking for a crowd. I’ve recently realized that you can buy a large cup of ice for 25c at McDonald’s. I often take a child in and use the facilities when we are out and about, and always buy a small item, figuring that that is only fair. I love eating a cup of ice when I’m hot, so have been getting that for my “treat.” (I just can’t make or store much ice in the camper and it’s much better for me than the other options) And, don’t worry, the company will never go out of business because of us–my children love those french fries way too much! It is much less expensive to buy one large fry and have them share than 3 small ones when we do make that choice. Oh dear….I started up another blog. I’m sorry I am so indecisive and you had to look around for me! It was hard. I’m still stiff and sore, but feel like it was so worth it! I have a stove EXACTLY like the one in your kitchen. Be careful when you make jelly. If it boils over, it will melt the top and leave holes. I really messed mine up. The stove is something we will replace, hopefully before next summer. Those kind are not recommended for canning and I can a LOT! I have never heard of pico de gallo. I looked the recipe up online and it sounds easy and yummy. I have everything on hand but the cilantro which I will pick up at the store. 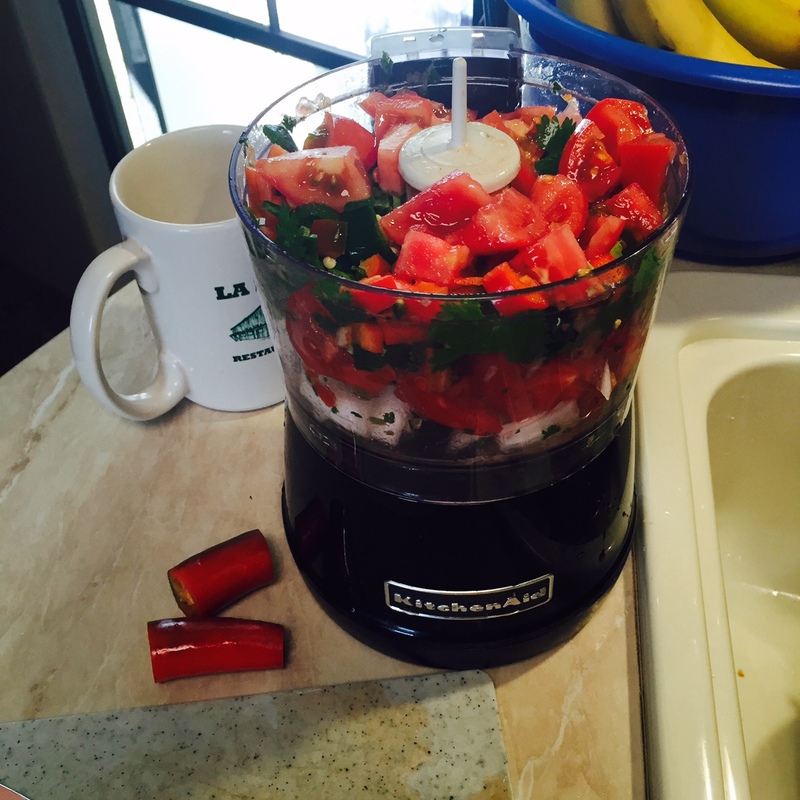 Is that a food processor in the picture – that would cut down the work of chopping the veggies? Thanks. Pat, it is a mini-chopper food processor. I had to make 2 batches to get enough. I just stick tomatoes, onions, peppers, cilantro, salt, pepper and a swig of lime juice in and pulse a little while. I’m sure there are more detailed recipes out there, but this works:) We LOVE it! I made one batch with virtually no spice for Lovana, and the other batch with a little kick for the rest of us.